Please select options for RedRock 4x4 Rock Crawler Rear Bumper w/ Tire Carrier - Textured Black (87-06 Jeep Wrangler YJ & TJ) at the top of this page. I'm Ryan from ExtremeTerrain.com, and this is my review of the RedRock four-by-four Rock Crawler Rear Bumper with Tire Carrier, fitting all 1987 to 2006 Wranglers. Today, I'm gonna tell you a little bit about the construction, the features, and of course, the installation of this bumper and carrier kit. This bumper is for those of you who want to get your larger and heavier than factory spare tire off of your spare tire manual location of the tailgate and put it onto a bumper-mounted tire carrier and it's gonna handle that additional weight and size a little bit better. This setup is going to be less expensive than a lot of the other bumper-tire carrier combinations on the market because it isn't quite as fancy and doesn't have quite as many features and as much adjustability. But if you're just looking for something to move the tire onto a tire carrier that isn't going to damage your tailgate and you're not interested in a ton of additional features, this will save you some money over those top brands on the market. This bumper is made from a three-sixteenths inch steel, and it's covered in a textured black powder coat that will resist rust and corrosion, as well as matching a lot of other aftermarket cheap parts and the factory black, plastic accents on your Wrangler. Now, as I mentioned, this doesn't have quite as many features as some of the other tire carriers and/or bumpers on the market. As you can see here, there are no D-ring mounts. It does not include D-rings for recovery points. However, it does have the two-inch receiver in the center that can be used for recovery purposes. The tire carrier is built the same way as the bumper, and it is going to be plenty strong. And one thing I really like about it is the way that the carrier itself attaches to the spindle. First off, the spindle is greaseable, which is a nice way to make sure that your tire carrier stays easy to open and close. However, if you do neglect the spindle and it does start to get rusty, all you need to do is loosen the two clamp bolts, remove the tire carrier, clean up the spindle, grease it properly, and put everything back together. Those tire carriers that are a solid circle that slide onto the spindle, if they do get rusty, sometimes it can be very difficult, if not impossible, to remove the carrier from the spindle, making it usable again. One of the areas of this carrier that does leave a little bit to be desired but is also a way that they're able to keep the cost down is on the latching mechanism. 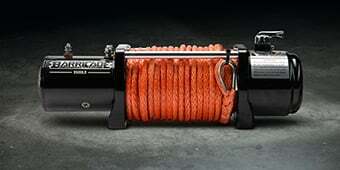 A lot of the more expensive tire carriers on the market, even some from Rugged Ridge, Smittybilt, Barricade, will have a latch mechanism with a handle that allows you to more easily unlatch and latch and keeps everything tight and rattle-free. This latch, it does rattle a little bit out of the box. And when you put a tire on it, it'll probably make even a little bit more noise. And the locking mechanism for this is a hitch pin that will need to be removed and reinstalled every time you open and close the tailgate. One other area of this tire carrier that I wanna talk about is right up here, the tire mount itself. It is in two pieces. The tire mount does adjust in and out, which allows you to make sure that the tire stays nice and tight up against the tire carrier, regardless of the width of your spare tire or the backspacing you're running. And that's a good thing. You want everything to be nice and tight, so nothing's torquing around, and you're not getting any metal fatigue. And it'll also help to keep the noise to a minimum. Unfortunately, this doesn't have a vertical adjustment or an up-and-down height adjustment. So if you're somebody who's running a 33-inch tire or maybe something around that size, this mount might make the tire look like it's mounted very high. And it'll also get in the way of seeing out of the back of your window. If this was adjustable, you'd be able to put a 33-inch tire down nice and low to give you maximum viewing out of the back window. But if you're running a 37, which is the max tire size that you can run on this carrier, then you could put it up high enough to not have any clearance issues with the bumper. However, this isn't adjustable. As I mentioned before, there are some other tire carriers on the website that do have adjustable mounts from some of those other brands. So if you're interested in that option, make sure you take a look at those. So, from a cost versus value perspective, I do think that you do get a good bit of value out of this. I talked a lot about the features that this doesn't have, but this is also going to be significantly less expensive than a lot of the other bumper-tire carrier combinations on the market. So this setup has its place. If you're on a budget or if you're just somebody who doesn't need or want a lot of those additional features, absolutely check out this tire carrier. This is a great option. 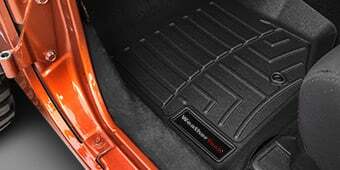 For instance, there's something very, very similar from Rugged Ridge out there that is almost double the cost, and it doesn't have any additional features. However, if you do want some additional features, there is everything from Barricade, to Rugged Ridge, Smittybilt, and a lot of other brands that have tire carriers and bumper combinations that have additional features. However, you should be prepared to spend a little bit more on those options. Getting this bumper installed on your TJ or YJ is going to be a really simple process, and I would give it a one out of three wrenches. The first step is going to be removing your factory rear bumper, which is done by removing the six bolts that hold it to the frame rail and onto the rear crossmember. Once the factory bumper is removed, you can go ahead and set your new rear bumper over the frame rails and attach it using the included hardware. Finally, you'll want to assemble your tire carrier and then slide it over the pivot on the rear bumper, finishing the installation. The whole installation won't take you more than an hour to finish, and you won't need any specialty tools to get it done, just some sockets. So if you're looking for a simple bumper and tire carrier combination to take that larger, heavier spare tire off your tailgate and put it onto your tire carrier, this is a good option. This is no frills. 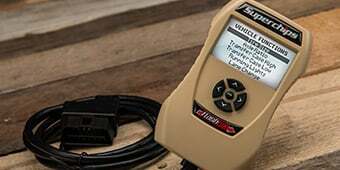 It doesn't have a ton of adjustment or a ton of additional features, but it's a simple setup that just works and will save you a ton of money over those other options on the market. So that's my review of the Red Rock four-by-four Rock Crawler Rear Bumper with Tire Carrier, fitting all 1987 to 2006 Wranglers. 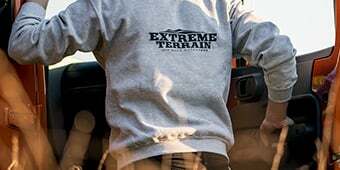 You can find it right here at ExtremeTerrain.com. Rugged Off-Road Styling. Add rugged off-road styling to your YJ or TJ Jeep Wrangler with a RedRock 4x4 Rock Crawler Rear Bumper that features an integrated 2 inch receiver hitch and swing out spare tire carrier. This RedRock 4x4 Rock Crawler Rear Bumper not only looks great, but also provides additional protection from brush and other trail hazards. Heavy Duty Construction. Manufactured from heavy duty 3/16" mild steel plating for strength, this RedRock 4x4 Rock Crawler Rear Bumper is completed in a durable textured black powder coating for aggressive good looks and long lasting corrosion resistance. Easy, Bolt-on Installation. The RedRock 4x4 Rock Crawler Rear Bumper is engineered to be a direct bolt-on upgrade using just basic hand tools, so there is no drilling or cutting required for a clean straight forward installation. Application. The RedRock 4x4 Rock Crawler Rear Bumper with Tire Carrier is designed to fit all 1987 to 2006 Jeep Wranglers, including the YJ and TJ models. Yes, this bumper would be compatible with the Barricade Roof Rack. 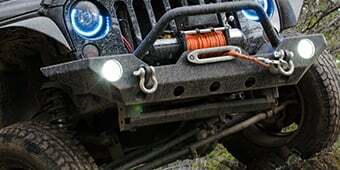 Can an existing bolt on hitch receiver, like the tubular Hidden Hitch, be mounted along with this bumper? I know there is a 2" receiver include with the bumper, but I would still like to tow with my rated hitch. The RedRock 4x4 Rock Crawler Rear Bumper is not designed to fit an additional hitch, and would most likely require modification to work with the Hidden Hitch. This will hold OEM pattern 5 lug wheels only. What is the wheel/tire combo on the green Jeep pictured? I like the way it looks. Thank you. 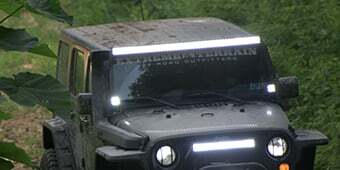 The Jeep pictured has Fuel Wheels Revolver Black Milled Wheels and Nitto Mud Grappler tires. Can the receiver hitch be used as a recovery point? Yes, this hitch can be used as a recovery point. The receiverhitch on this bumper is not tow rated, therefore there is not a tounge weight rating. The length of the tire carrier is approximately 44 inches. The RedRock 4x4 Rock Crawler Rear Bumper w/ Tire Carrier is not rating for towing and therefore doesn't have a weight rating or tongue capacity listed. The bumper and tow receiver are sturdy, so they may be used for recreational use and they do have the capacity to hold lighter items, however, this type of use is at your discretion and is not tested by the manufacturer. The RedRock 4x4 Rock Crawler Rear Bumper w/ Tire Carrier will fit a 1987-2006 Wrangler Sport. Unfortunately there is not a way to mount this bumper with an existing tow package. The accessory hitch of this bumper would interfere and so would the mounting points unfortunately. The RedRock 4x4 Rock Crawler Rear Bumper does not have provisions for a tire carrier mount. 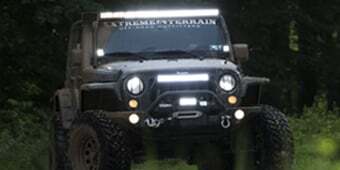 Hello, we do have some options for only tire carriers, which you can find here: http://www.extremeterrain.com/wrangler-jeep-tj-tire-carriers.html#shop-by2 but we wouldn't be able to guarantee fitment on a Warn bumper. Hello, I would love to help assist you with this question but to answer accurately I would need a little bit more info on your build. If you would be interested in giving us a call one of our team members would be more than happy to help you. Straight forward install. Priced cheaply but does skip out on anything. You can tell the quality of the bumper by just picking it up. Easy way to give an aggressive look while replacing your rust bumper. And matches my smitttbilt front bumper perfectly. The instructions could have been more detailed. I was not aware that the fuel tank had to be dropped for the bumper install. Got the bumber for what it is not bells and whistles. Easy install. One month some actual off-road no issues. Would recommend an additional rubber support between rear hatch and upper bumper beam. First time dealing with Extreme Terrain and will definitely continue. This bumper is great easy to install perfect fit and lots of compliments! The rear bumper with tire carrier is not great but will work. The textured black paint is not really made to take any punishment as simply unboxing it caused scratches. During the install the coating actually pealed off in a Quarter sized area. Found matching paint to touch it up at Lowes.... The tire carrier is stiff but getting better although the install was awful. The directions are very simple and not at all helpful. I have installed two lift kits and this is my fourth bumper in two months on our TJ and JK Rubicon. This was by far the worst install. Love the look, fit and practicality of the carrier. Great fit and look for my TJ. Video on the installation really helped me. Fit well, built well. I'm going to have to weld on lower tabs as original bolts busted when removing the original bumper. Was looking for something a bit more than factory to hold up my spare and this was super easy to install and looks great. The latch can be a little tricky but once you figure it out it’s super easy to open and is also convenient. I haven’t taken it on any trails yet but it seems to stay in place and not knock around a bunch which is what i was scared of. I've seen better rear bumpers, but for quite a lot more money. For the price, I have to say that I got more than I was expecting. As long as you line up the rubber bumpers on the tailgate, there is little to no rattling at all. I do wish that RedRock developed some accessories for this bumper like a jerry can mount or a hi-lift mount, but the bumper and tire swing are heavy and seem to be well built with good welds and a nice textured black paint. Maybe it was just me, but when I went to put the tire swing onto the rear bumper, the opening wasn't large enough and I had to use vice grips to bend it to the right shape. It still got on and the tire swing still opens smoothly. Overall I am satisfied with the purchase and product. Product fit good except directions are bad . It had a extreme rattle until I added a large spacer behind rubber bump stop. Very easy to instal no wiggle noise or anything like that. The only piece that needs a extra tool is a c ring. The RedRock rear Bumper W/tire carrier. Looks nice and was easy to install. I have a 90 YJ 4.2 that I use for my motorcycle repair shop. I have a small 5x10 trailer that I pick up bikes with and having a jeep is awesome. This RedRock rear bumper w/tire carrier looks awesome and installs in less than an hour. However, I have to use 2 pennies to keep the locking latch from moving around making too much annoying noise. The BIGGEST concern is that this 2" receiver is not tow rated! nothing in the advertising states this. It is located in the top right corner go the installation instructions. However, looking at how and what it is made of I am pretty sure that it can handle at least 1500lbs. I have already used the trailer with one heavy bike at least 600lbs and a Joe Hauler hitch mount with a small dirt bike.